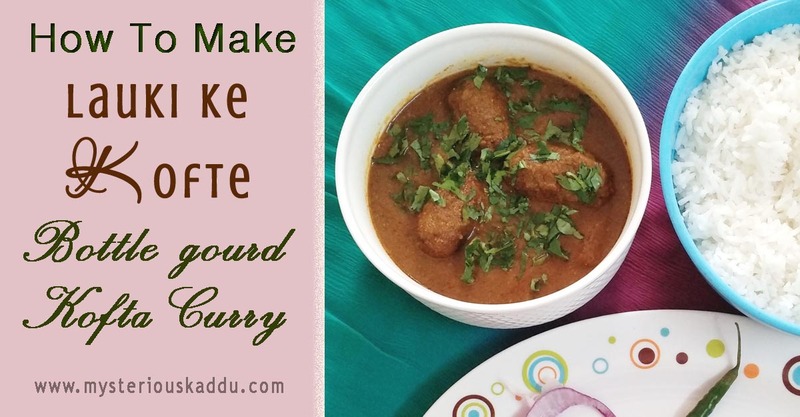 Lauki Kofta Curry is a popular Indian lunch/dinner recipe, made up of a luscious onion-tomato gravy, dunked with deep-fried bottle gourd koftas. Now bottle gourd, or lauki, or as it is known in some parts of the country, 'ghia' or 'dudhi', is a very healthy vegetable, with high water content. It aids in digestion, prevents constipation, reduces inflammation, and promotes weight loss. But, despite its multiple health benefits, a lot of people don't like to eat it because of its "plain-Jane" watery taste. Some even refer to it as "bimaaron waala khana" (or the food of sick people)! Perhaps, that is the reason why this lauki kofta curry recipe was invented. To somehow get all those lauki-haters eat this healthy vegetable! LOL! So here's my step-by-step recipe for making this lauki kofta curry, or these ghia or dudhi ke kofte at home. Mix 1 tsp salt in the peeled and grated lauki, and set aside for 10 minutes. It leaves all excess water with the salt. Squeeze this water out into a bowl and keep it aside. Heat the oil for frying in a deep wok (kadhai). 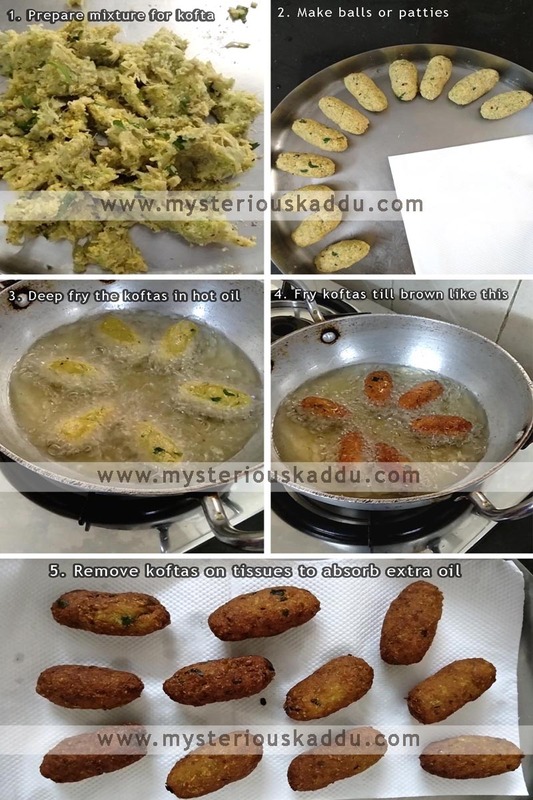 Remove all the oil left in the kadhai, leaving behind just about 1.5 to 2 tbsp. Fry this paste for about 8-10 minutes, until it starts to leave oil from the sides. Add salt, water, and the lauki juice kept aside earlier. Mix well. Add the fried koftas. Add some more water if the gravy is too thick. Allow to simmer for about 10 minutes, then take off from heat. Allow koftas to marinate in the gravy for at least an hour before serving. Serve hot with fresh chapatis or naan. Serve with green peas pulao, or jeera rice, or simply plain boiled rice. That's it. Your delicious homemade Lauki Kofta Curry is ready! Instead of lauki, you can also make koftas of paneer (cottage cheese), or mixed vegetables (especially in winters), or even boiled potatoes or raw bananas. And you can add chopped cashewnuts to the ingredients you blend for the gravy. It gives a thicker texture and adds a rich flavour. You can also add some fresh cream or milk cream to make the curry creamier. 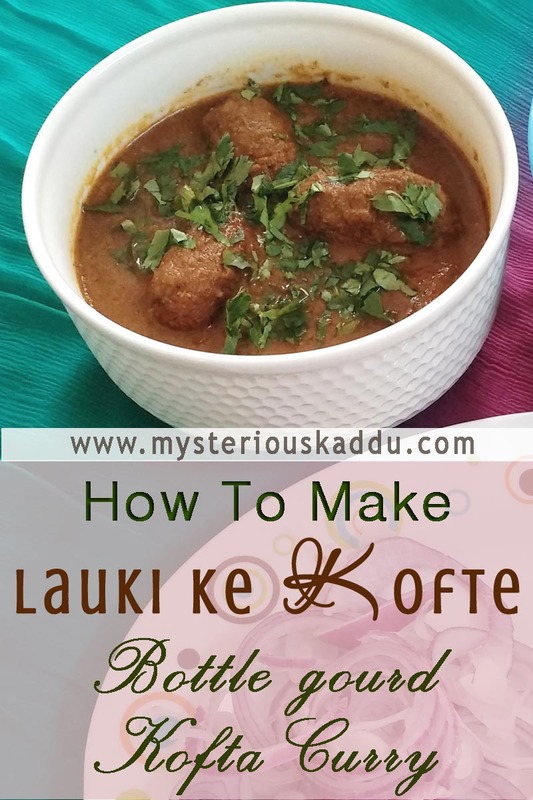 If you try out this Lauki Kofta Curry, do let me know how it turned out. If you make this any differently, please share in the comments below. I would love to learn new styles. This is my 11th post for A to Z 2019. Lauki is one of the few vegetables that I try to avoid eating but my Dad loves it. So I am going to try making these koftas for him next. This is something my mum prepares often. I used to make lauki curry earlier. Had forgotten the dish. I will try this recipe. as such dudhi is not much liked by my family members. The only way I can ever enjoy Lauki is when it is dressed up as a kofta in a curry or disguised in the form of Halwa. Your recipe looks good. I love lauki kofte. I was one of the kids who never liked lauki ki sabzi but devoured every bite of kofta! You know I've never made the kofta myself. Was never confident about it, honestly. And now, reading this recipe, I really think I can make it. And I am going to give it a try on Monday mostly! One of my favourites and look at the kaufta in the picture. So perfectly rolled out. I missed you. Visited the blog a few times looking for you. Great to read this post! Wow! You have knack for making this dish. Louki kofta is my favorite along with lauki prepared with posta dana. Thanks for giving a detailed recipe!